The area now known as Wakapuaka was one of the earliest parts of the province to be allocated to settlers (1842) . It was originally given the name Suburban North by the New Zealand Company Surveyors, but Wakapuaka was the Maori name for the area. An area which covered the Glen, Mackays Bluff, Hira, Cable Bay and Delaware Bay. The Nelson Examiner, in September 1842, gave the name as Wauka-pa-wauka but many settlers, unable to pronounce the name as the Maoris did, simply called the district Hokeepokee. The early settlers of Wakapuaka Flats and Glenduan (the Glen) had to contend with swampy land and regular floods. 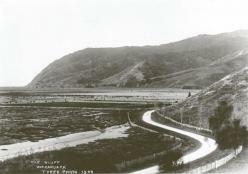 The main road curved around on the hill behind the church, where possible avoiding the tidal flats and swamp land. Settlers created a stopbank to keep the tide out and dug miles of drainage ditches to gradually reclaim the flats to farmland. 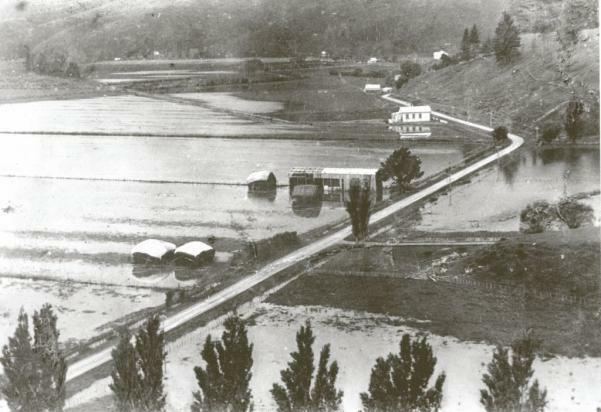 Floodwaters covering the Wakapuaka Flats, 1930. (Wastney Family). The bends in the road approaching the Glen Corner, with The Foresters Hall and Black Horse Inn (top of picture). The Flats were subject to floods until the present system of large drains and tide gates was completed in 1958. James Mackay was one of the first settlers, naming his farm Drumduan. He erected a prefabricated house and after much quarrelling with neighbours settled down to become a well-respected member of the small Nelson community. His large funeral procession, which left Nelson with sixteen carriages and many horsemen, gathering mourners from each valley as it progressed to St Andrews, reflected his community standing. Both James and his first wife, Anne, are buried at St Andrews. Hillside School (1898).(N.L. Wastney)The school stood on the hill above the road at the Glenduan turn-off . There were two schools on the site from 1857-1926. 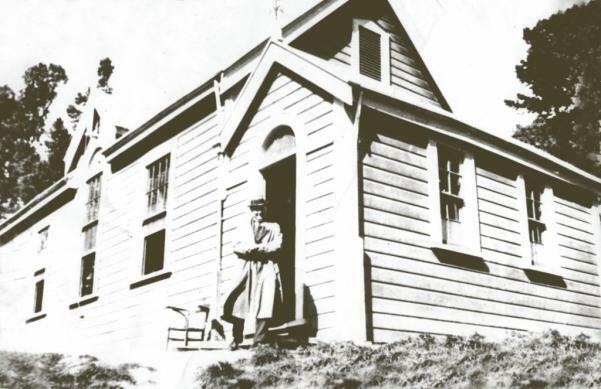 In addition to St Andrews Church, the local community enjoyed the facilities of the Foresters Hall (burned down 1946) , The Black Horse Inn (burned down 1958) and Hillside School, while towards Gentle Annie stood May's Wakapuaka Store. 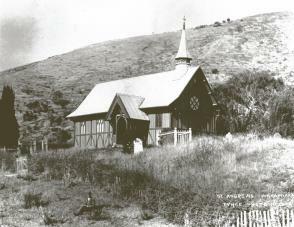 The opening of St Andrew's Church on 29 April, 1865 was the result of community fundraising and the gifting of land by Mr J M Pierson of Thackwood. The site had been used as a burial ground for several years - two people, Anne Mckay in 1860 and Isaac Webster in 1864, were buried there, and the churchyard was cared for by the local community in the form of the cemetery committee. The church, designed by architect William Beatson, soon became a community focus for many families with a regular Sunday service and Sunday School. Babies were baptised, young people were confirmed, couples were married and mourners gathered at funerals; the joyful and sad events of human lives. Fundraising continued to be a regular part of church life with bazaars or fairs held annually with the other Suburban North churches. For many years Suburban North was served by men who gave part of their time to tutoring at Bishopdale Theological College . At other times men from the Cathedral and from All Saints gave their services. In 1913-14 the Reverend T F Taylor was in charge of the Port Mission Hall while acting as Vicar for Suburban North. In his time the first vicarage was built in Todds Valley in 1913. Gradual social changes in the district led to a decline in the use of the Church and, in 1960, it was sold for use as a farm building and taken to Seabourne Farm. Cyclone Alison, in 1975, finally destroyed the building. The font had been given to Bishopdale Chapel; the cemetery remains here on the hillside. The only remnant of the building in situ is the front step. The Waimea County Council agreed to designate St Andrews Churchyard Cemetery an Historic Site within the Waimea County in 1975. Local community groups cared for the place for many years. The Nelson Diocese gifted the site to the Nelson City Council in 2004. Ault, H.(1958) The Nelson Narrative : the story of the Church of England in the Diocese of Nelson : New Zealand 1858 TO 1958: with an account of the years 1842 to 1857, Nelson, N.Z. : The Standing Committee of the Diocese of Nelson.